3X:Chemistry Total Clean is a non-silicone cleaner that protects against UV rays, resists dust and leaves behind no greasy residue. This unique formula makes it the best all-purpose product that does many jobs in one easy application. 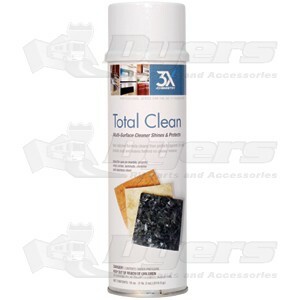 Total Clean sprays out in a fast breaking white foam that lifts dirt and deposits from the surface for easy cleaning. Specially fragranced with a powerful deodorizer, it refreshes as it cleans. SHAKE WELL. Remove cap and turn actuator toward dot on valve cup. Hold can upright 6-12 inches from surface to be cleaned. Cover the area with a light spray - do not over-apply. Wipe clean and dry with a dry cloth. Be sure to use a clean cloth to prevent reapplying deposits. Not for use on glass or mirrored surfaces.